Every day millions of people all around the world use railway transport. For many passengers taking a train is an everyday routine, since some simply commute day to day to/from work, others must travel as a part of their job etc. However at the same time for many of us taking a train is perhaps not such an ordinary experience. Imagine a student on a train finally returning home after a semester of study abroad, or maybe grandparents paying a visit to their (grand)children in a far away megalopolis, or just a tourist who had to save money for a number of years in order to travel around Europe with hop-on hop-off rail pass. For all of them taking a train becomes THE travel experience – in some sense unusual & promising, for some perhaps even a bit nostalgic. On the other side of the fence – in the world of rail companies – it is all about constant, sometimes even aggressive, competition for passengers. And such state of affairs is not surprising, because the rail operator success formula is relatively easy (and obviously not very unique) – bigger passenger flow brings higher profits. That is the reason why each and every rail company tries to search for the best ways and channels to communicate with their potential passengers, to persuade you and me to use their services. a) An argument of eco-friendliness. Trains being presented as more energy-efficient (per passenger) and polluting far less compared to airplanes and cars. The slogan “go green – take a train” (or such like) can be found in the arsenal of almost all rail companies. Probably one of the best examples here is the EuroStar Group (running high-speed trains from London to Paris & Brussels), among the first heavily relying on environmental efficiency topics. b) City-to-city easy access with no hassle. Historically train stations tend to be located in city centers, thus taking a train promises passenger departure and arrival to the city center, no need to travel to the distant airport, spend time for check-in, security checks and other air travel related nuisances. The overall practicality of choosing rail transport is widely stressed. c) The promise of comfort. Traditionally train seats (and especially berths) tend to be more spacious and comfortable compared to bus or airplane seating. Train passengers also can always easily stroll around the carriage, stretch, visit the dining car etc. d) Beyond just transportation. Rail companies tend to advertise scenic views from the train window as something totally different than clouds seen through plane windows or highways with cars passing by. Train passengers are often promised to expect spectacular scenery. Probably the most successful examples of such branding of train trip can be seen from Swiss private railways running touristic trains (Glacier Express, Bernina Express and the like). Rail journeys just for the sake of enjoying picturesque natural beauty. e) Old-fashioned charm. The globalized world is usually about speed and air travel, so rail operators came up with a sort of contrasting idea to sell – the train journey portrayed as something refreshingly traditional. The passenger is offered not just a ticket from destination A to destination B, but the experience of the journey. An experience like a trip taken from a movie script of the old film or a diary of someone who travelled on the late 19th century Orient Express. The general argumentation behind taking a train is obviously only a tip of an iceberg, basically a shared visible ‘flag’. While at the end it inevitably comes to promoting only your company or your train, and here examples and possibilities are definitely much more diverse. For instance just last year Italy witnessed an arrival to the domestic market of the new private rail company Nuovo Trasporto Viaggiatori (NTV). One of the main shareholders in the company was well-known Luca di Montezemolo (Chairman of the Ferrari Company). 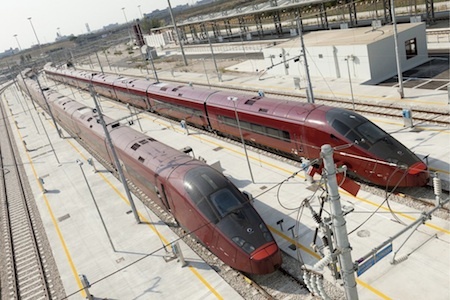 NTV’s initial project was to introduce totally novel high-speed train service (brand ITALO) between major Italian cities and, obviously owing to the persona of di Montezemolo, the new trains received the nickname ‘Ferrari of the Railyards’. Keywords like ‘Ferrari train’ appeared in the reports of all the major media (CNN, Spiegel, The Guardian, Forbes etc.) describing the new rail service. Italo trains were almost instantly praised for the level of comfort and service never seen in Italy before. As result nowadays even ordinary passengers, and especially visitors from abroad, would refer to the NTV rail service as being associated with the Ferrari brand. And definitely in this case the reference to Ferrari is rather symbolic and brings along quite obvious connotations and meanings favorable for the company exploiting such branding. However the funniest thing in this story is that NTV-Italo trains actually have almost nothing to do with Ferrari (maybe besides the choice of color and the persona of di Montezemolo). They were produced by French transport corporation Alstom. But does it really matter if NTV managers can maintain the Ferrari connotations? 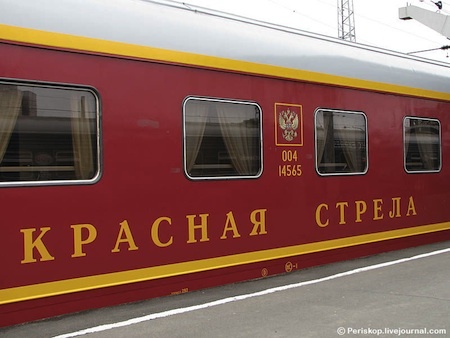 Another case concerns a train from the other side of the European continent – USSR/Russia. Probably almost everybody who lived or traveled by rail in USSR/Russia will know about the famous Red Arrow train from Moscow to Leningrad/St.Petersburg. It is a case where one particular train became a brand and an easily recognizable symbol. For a start, all the carriages of the train historically were painted in a unique dark-red livery, plus every carriage has the name of the train written on the side, so that anybody who sees this train even from a distance will be able to recognize it (a sort of Jakobson’s visual sign denoting a particular train). Secondly, the Red Arrow train has a rather symbolic train number – 001/002, in a way symbolizing importance (i.e. being the first) of rail connections between two Russian capitals. Thirdly, during the departure of the train a special song is played throughout the station, so it is not just about livery, color or number, but also about auditory signification – letting everybody know that it’s time for the departure of train #1. There are dozens of examples from all over the world illustrating rail companies’ deliberate branding of some of their products (like a particular train or high-speed service), branding which in a way creates a recognizable symbol, a sort of assurance of the very special travel experience a passenger will get the minute he or she boards the train. So next time you plan to travel by train make sure you pay attention not just to your ticket and departure time, but to a ‘story behind your train.